Magog, QC, September 14, 2017 – Camso expands its current collaboration with Yamaha Parts and Accessories, a division of Yamaha Motor Corporation, U.S.A., with the aim of extending dirt-bike and ATV owners’ ride. Dirt bike riders seeking to enjoy their vehicle year-round will be able to add Camso’s dirt-to-snow bike conversion system, the Camso DTS 129, to Yamaha’s WR450F™. Meanwhile the all-new Yamaha Kodiak 450® mid-size all-terrain vehicle will also be available with the Camso ATV R4S track system as an option, allowing greater access to a broader playground for less. 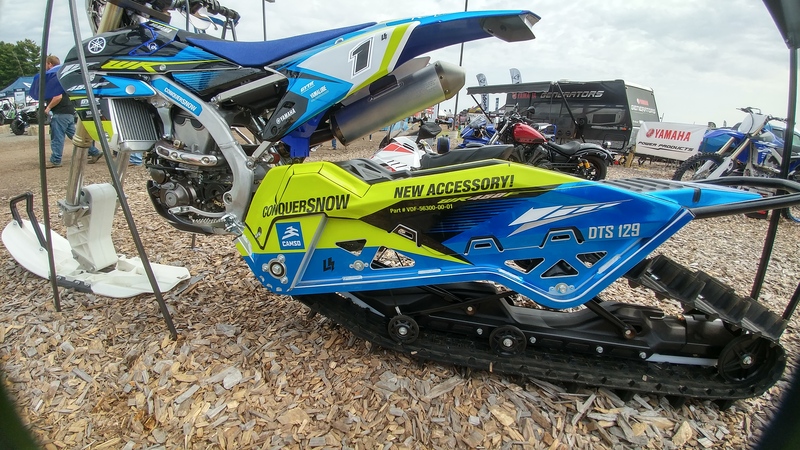 The new snowbike offering, in addition to the availability of track system on their newest ATV, ensure all-season mobility for Yamaha customers. “With Camso’s unique product technologies and deep understanding of niche markets, it was a natural choice to expand our collaboration to include the Camso DTS 129 and ATV R4S track systems,” said Frank Pittman, Vice President, Customer Support Group, Yamaha Motor Corporation, U.S.A.
Building on this collaboration, Powersports enthusiasts will be able to purchase the Camso DTS 129 and ATV R4S through Yamaha’s authorized dealer network, using the same distribution model as the existing agreement with Yamaha for sales of Camso’s ATV T4S and UTV 4S1 systems. Headquartered in Cypress, California, Yamaha Motor Corporation, U.S.A. (YMUS) is a leading distributor in the motorsports market, with the most diversified line of such products in America. Yamaha’s ever-expanding product offerings include motorcycles, ATVs, Side-by-Side vehicles, personal watercraft, snowmobiles, boats, outdoor power equipment, accessories, apparel, and much more, which are sold through a nationwide network of dealers in the United States.